A personal development journal is for you personally. Does keeping a personal development journal sound too ambitious? Do you hate writing or does the word "journal" give you the creeps? It is possibly so because of what you associate with the word. From now on, let´s think of a journal as something purely positive. It is indeed personal, because nobody else is ever going to read it. It is for your eyes only. Furthermore, as you begin to explore your thoughts, emotions,dreams and goals in life, you really do need a journal to record your ideas and thoughts about it. For more ideas, go to this page with an example of a personal development plan. Accordingly, a personal development journal is nothing scary or complicated. 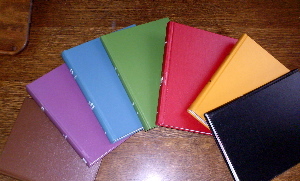 It is a simple note book that you can make as elaborate or simple as you wish. An ordinary note book from anywhere will do, although some prefer to get a beautiful book with exclusive paper and glossy covers. In my experience however, if you make it that fancy, you tend to treat it too respectfully and might not use it on a daily basis at all. Worried to sort of mess up the "look and feel" of the journal. Only you know yourself in that respect. Just get a note book of any kind and use it! How do I use a personal development journal? The simple answer is: just write down anythingthat occupies your thoughts. Like a diary, really. Be totally honest when writing. There is nobody to impress upon, nobody to fool either. So just keep to your innermost emotions and thought about what is going on in your life. The purpose is to get it out of your head, into the open. This is especially important with negative emotions and discontent. First get it out, so you can deal with it. If it all stays in your head, it will occupy too much mental space, and NEVER rent space in your mind to things you do not want! Write every day at roughly the same time. Regularity supports your mind and makes it a habit. Do not try to be structured or organized! Be as spontaneous and silly and outrageous as you like! This is a free zone with no judging eyes. IF brilliant ideas come to mind, of course do elaborate on them. Over time, you might want to transfer certain things to other journals, like "my strategies for success" or "my daily affirmations". But do not plan for it to happen. Your personal development journal naturally reflects your inside. Learn more about keeping a personal development journal from our newsletter. Leave Personal Development Journal and Return to "What is Personal Development?"